Prehistoric Pteranodon destroys Japanese city. Military weapons have no effect on it. Burying it under a volcano works though. 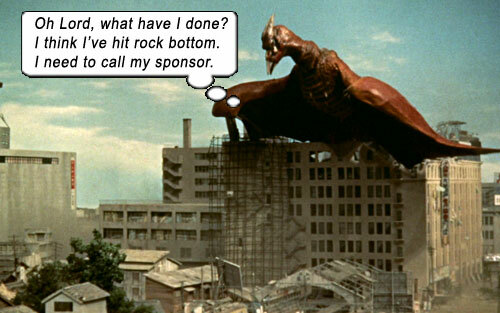 Such is the prosaic plot behind RODAN, a Japanese monster movie made while Godzilla wasn’t looking. The movie itself has its strong points, due to the talent involved – literally, the full team that brought us the original and best GODZILLA (1954): director Ishiro Honda, writer Takeo Murata, producer Tomoyuki Tanaka, and even composer Akira Ifukube. The new beast they belch forth, RODAN, is not as epic and tragic a figure as Godzilla, but its debut here is far from the swill Toho Company would later churn out like dog poop through a sausage maker. So do we surmise the H-bomb spawned Rodan? But nowhere else in the movie is the H-bomb mentioned; Rodan is identified as a prehistoric creature that was hibernating in a deep volcano, and only the interference of mining so deep roused him from his egg. Also in the American edit, we have to put up with lead character Shigeru (Kenji Sahara) narrating – an American dubber putting on a Japanese accent, and speaking for this character, who doesn’t have narration in the original film. Like THEM, early scenes where people are disappearing are eerie, but – also like THEM – only until the monsters are revealed; until that giant caterpillar shambles around the corner and we giggle, because we see it’s just two guys in a caterpillar suit like a pantomime horse (one guy in the front thorax and another guy in the back thorax). And what eats giant caterpillars? Why, a giant bird of course! But we spend the whole second act not knowing what it is – Rodan first appears as a mysterious supersonic “UFO,” outracing jets and destroying them, then toppling bridges and buildings. The mystery unfolds slowly, with good use of flashbacks. When we eventually see the giant bird, it is effective, because we know the power it possesses. The somber young Akihiko Hirata (who played tragic, eye-patched Dr. Serizawa in GODZILLA) is the lead scientist. But he is not like the conservationist Dr. Yamane character in GODZILLA – there is no heft given at all to keeping the Rodan creature alive for study or conservation. This movie is purely humans-good, creatures-bad. Cue toy planes. When the toy planes fail, bring in the toy tanks! When they too fail, blow up the volcano where the creatures live. Padding explosivus maximus. Then the climactic moment, which I’m sure must have been played more poignantly in the Japanese version: one Rodan catches on fire and falls to her death on the lava. The other Rodan, rather than leave his mate’s side, tries to save her but is also engulfed in flames. I’m giving this version a pass because I’ve seen how horrendously American edits butcher Japanese movies, but I believe the Japanese team wanted to play this creature the same way they played Godzilla being shaken from his home and retaliating; blameless nature at the hands of technology, etc. None of this comes across in this version of the film, but I’m sure that thematic content is on some American cutting room floor, otherwise why bother inserting that U.S. bigdick explosion in the front of the film? aka: SORO NO DAIKAIJU RADON. aka: RADON THE SKY MONSTER. Writers: David Duncan, Takeshi Kimura, Ken Kuronuma, Takeo Murata. Starring: Kenji Sahara, Yumi Shirakawa, Akihiko Hirata, Akio Kobori, Yasuko Nakada, Minosuke Yamada. Version: American edit, dubbed English. Originally called RADON, but imported as RODAN, because in Britain, Radon was the name of a toy, and in America it was the name of a soap! First Japanese daikaiju (big monster) film in color. You’re not seeing double: many of the shots are “flipped”; a prime example being the two Rodans in their caves – they show one facing one way, then show the “other” facing the other way, which is simply a mirror image of the scene they just showed. The city of Fukuoka is being destroyed. In the American version, they call the city Sasebo. Why? Well, try saying the word Fukuoka with the mentality of juvenile Americans. Teen George Takei overdubs in the American edit. Cartoon voice legend Paul Frees overdubs in the American edit. [from imdb] Rodan’s original Japanese name, Radon, is actually short for the Japanese word for Pteranodon (“Puteranodon”). That actually makes sense. King Brothers Productions, who pasted the American prologue onto RODAN, would be responsible for GORGO five years later.